Darn it! I wish I had taken a photo. Of the spaghetti-like tangle of black cables and thick electrical wires that the satellite TV crew left in the corner where our cable-box/TV are set up. Aims and I looked at each other and just grinned. O.K. - maybe this is “industry standard” for the Indian cable industry. To my dear Marion Jacobs….somehow I can’t see you allowing a cable-crew to leave your house in Napa in anything close to this finished condition! “Hey! At least it works!”, we said to each other. And it actually works GREAT! Includes ESPN, CNN, BBC, HBO. No complaints about the quality of reception. Some channels are even in HD!! We didn’t even have HD at home in Pasadena! I can’t take a photo now because first thing this morning (after the Lakers game - - what a strange feeling it is to watch an NBA Finals game from Staple’s Center at 5:30 in the morning!!) - - our super-caretaker Krishna got all of the wires ship-shape and now it looks just fine! I gotta tell you, dear reader, that electricity here is a definite adventure. I mentioned before that we were gifted with an old power converter-box. 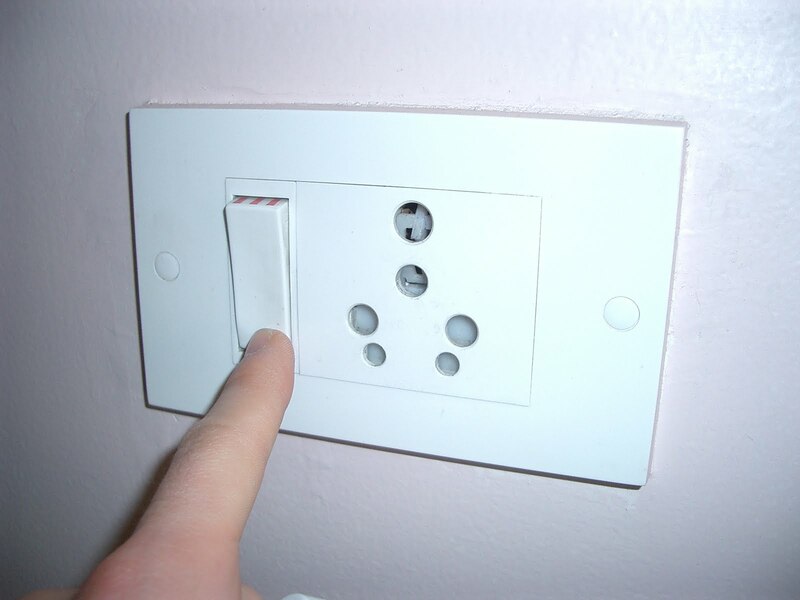 This is for plugging in our American computers and other electronics. 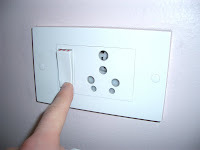 There’s a couple of different kinds of plugs, adaptors and converters. The charger for my new Indian Blackberry (still not up and running!) has a really bizarre-looking plug - but Krishna knew what it was and found me another kind of adapter that seems to fit the bill. But whenever I plug something in to it…I get a pretty hefty bluish flash that sparks out of the actual socket. The first time I used it, I saw the spark and dropped the cell-phone charger that I was attempting to set up. Aims was sitting up in our bed, with her "still-fairly-useless" laptop across her knees (hopefully all electronics will be up and running today….as a matter of fact, the Internet guy is here now setting us up a wireless modem and router!!) - praying for a new and improved alignment of the stars so that she could answer an e-mail or two! She chuckled at my “sparks” predicament - “I get sparks every time I plug anything in at the office! !”, she said. So, I reckon sparks may not exactly be a GOOD thing - - but - it’s evidently entirely normal!! The two other electronics purchases we made were from the CROMA store - think Best Buy, but more compact...and full of people who really want to help you! It's close-by, right down the main-drag a ways, over toward Jubilee Hills. First of all, we got Amy Suzanne a nice, smaller HP printer that’s supposed to be excellent for printing photos. For a good reason, too. She came upon a great idea. You see, she will be supervising 120+ Indian employees in her new position at Deloitte. Except for the few that were out sick (here they say “un-well”) - - she met in meetings with all of them individually during the first week she’s been at the new office. Her problem is…it’s very important here to know everybody’s name. First names, especially. Only here they call it your “Good Name”. A guy at the golf course asked me my “Good Name” the other day - and I didn’t have a clue what he was after. Now I know. “Good Name” = your first name. Her idea? To take everybody’s picture and print them out. Then she’ll write the Good Name of each of her people on the backs of the photo, and we’ll use them like facial-recognition flash-cards! With 120+ names to learn, this may be the best way, by far, to get this done. Part of the problem (as you might imagine!) - is that her people are not named “Bill” or “Sue” or “John” or “Sally”!! Anyway…she has our camera at the office today, to begin the “portraiting process”. The next electronic gizmo that “we” purchased was MY choice. Yeah, baby!! A little touch of home! It’s really just an FM radio and alarm clock. But it has a cradle on top where you can attach your iPod or iPhone - - and it will play your library of music. It even has a remote control that works from across the bedroom. Nice!! With Suzanne’s regular shift (after things settle down a bit) being 5:00 A.M. ‘til 2:00 P.M. - - we are going to need to set an alarm for almost the first time since we’ve been married! Anyway, I love this thing. The speakers are not great (I know that Bose makes something similar, but it's way more expensive! This one was something like Rs 3,600.00 - - like $60.00) but they sound much better than the one tinny little thing on my laptop. I’m listening to the Grateful Dead’s “American Beauty” album right now. Nothing says “home” like a little of The Dead as a background soundtrack!! Hey, John Adams...do you know what time Jim Ladd has a radio show on now - and what station?? Back to the electricity. I’ve been cutting my own hair over the past several months. Well, with a little assistance from Suzanne. With my shoulder-injury, there’s a couple of angles I just dare-not attempt. Plus there’s the back of my head…that is just something I won’t try for fear of giving myself the old “reverse Mohawk” look with a slip of the wrist! I brought my whole clipper-set along with us. I caught a glimpse of my hair last night, before we went out to an awesome dinner with Stephanie, Marilyn, Brenda and Stephanie’s husband Cory. It was at a really special restaurant called “Siaa” (Pronounce "Seee-ahh". 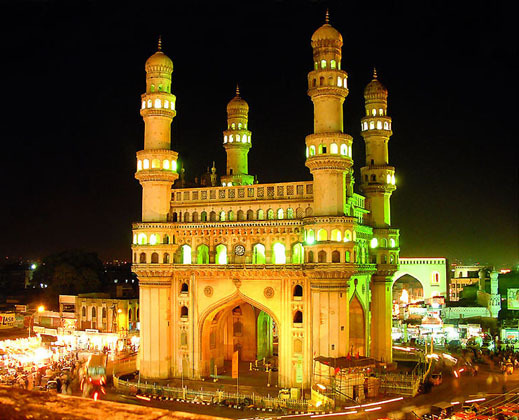 Google it - “Siaa, Hyderabad” - some of the reviews say it all - fantastic!) in Jubilee Hills. The food was outstanding! And they give Deloitte employees a discount as well! This will definitely be on the list of our “special places for special dinners” places. Really, really a supernice place! Anyway…back to my hair. Seeing how I needed to trim it up a bit…I pulled the clippers out from the bathroom drawer and attached the old “#2 comb” - - and grabbed the funny-looking adapter. I plugged both of them in and gave the clippers' on-button a push. The poor thing started vibrating like a bloody jack-hammer in my hand! I yanked the plug and adapter out of the wall (along with the customary blue spark, of course!) I unplugged computers and other things (NOT my Grateful Dead! Sheesh!!) from the black converter-box in the bedroom, and set up my “barber shop” on the bathroom vanity… and tried the process over. There’s obviously something about the electricity here that my clippers’ motor just doesn’t like. Same symptoms. The poor old clippers just shook and rattled loudly in my hand ... until I mercifully turned them off. I guess I might just have to go out and spend a few rupees on a new set of Indian clippers! Or - hey - how about getting a professional haircut?!? What a great idea! I’ll report on that trip later! Oh…lest you think it's all blue-sparks and primitive living here (as I type this we have gone to emergency backup generator...the A/C keeps cutting out and it's getting bloody hot in the bedroom!) I need to write the report from our run out to Boulder Hills Country Club (For Andy Murray - definitely "Charles fully in charge" at this one!!) and Amy’s first visit to see the horses out at Hyderabad Polo and Riding Club. It was pretty emotional for her…and me, too, honestly. I think I might choke up a bit writing about it…and the Internet guy is still here. He already thinks I’m a dork - - sitting here blubbering would really seal the deal!